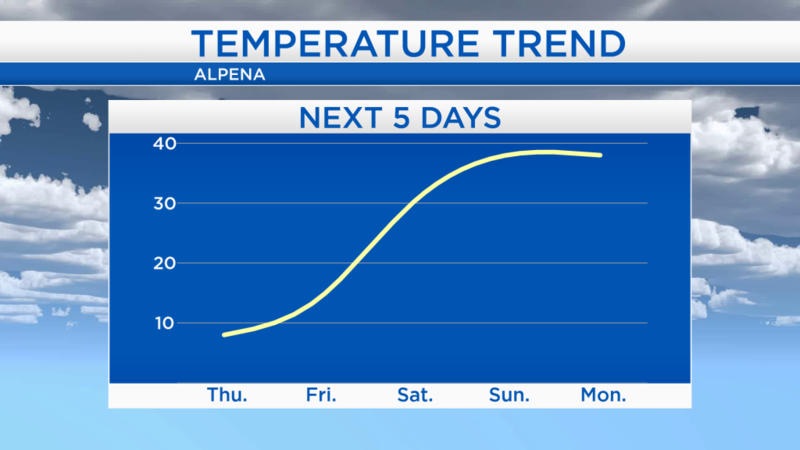 The high temperature in Alpena reached 5 degrees today. 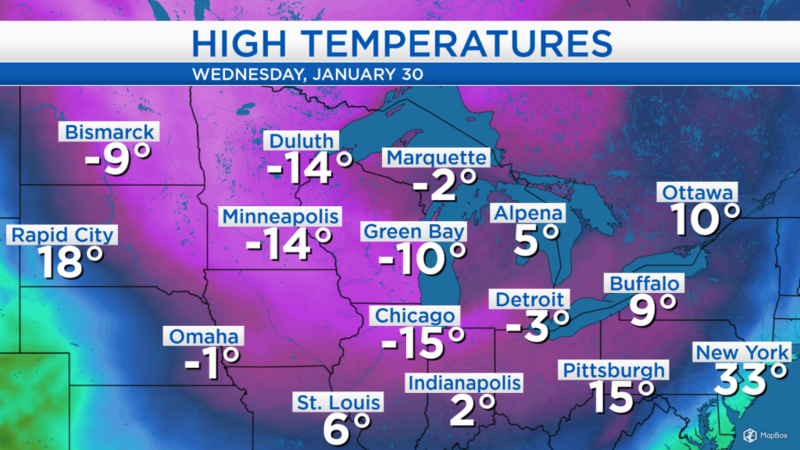 While that is about 20 degrees colder than normal, the high temperature reached only -14 in Minnesota. In parts of Minnesota, wind chill values last night plummeted to around -60! The cold air extends as far south as Oklahoma, Arkansas and Tennessee where temperatures were below the freezing mark this afternoon. Eventually, some warmer air currently building into the Plains will shift east, arriving in our area region this weekend. Cold air moving over Lake Michigan has generated lake effect snow, some of which has effected Alpena, Montmorency, and Presque Isle counties today. The lake effect snow will weaken tomorrow, then drier weather will move into Northern Michigan for the end of the week. Overnight wind chill values will once again drop into the -20s causing frostbite to happen within 20 minutes. Definitely cover any exposed skin, dress in several layers, and have extra supplies on standby in your car including blankets, food, water and jumper cables. Tomorrow’s high will reach 8 degrees with mostly cloudy skies. Finally, our temperatures will start warming at the end of the week. On Friday, afternoon temperatures will reach the teens. On Saturday, temperatures will warm to around 30 degrees, then approach 40 degrees on Sunday. However, some messy weather appears likely for the second half of the weekend. 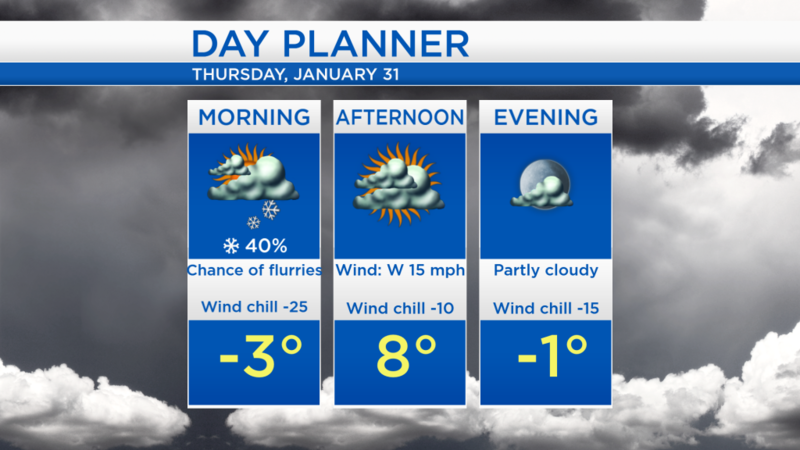 Thursday will remain cold with temperatures only getting into the single digits for afternoon highs. Friday will start very cold, after an early-morning low of -8 degrees, some more sunshine is likely with a high of 14 degrees. Warmer temperatures will arrive on Groundhog Day, climbing to 30 degrees on Saturday, although a chance of snow showers will develop in the evening. On Sunday, snow will likely change to rain as temperatures reach the upper 30s. For the rest of Northeast Michigan’s weather forecast, watch the latest weather video by clicking the weather tab at the top of the page.